All dogs, regardless of size, breed, and age are curious animals that like to pull their leash and run after things. Also, dogs have their own way of walking, which can be too fast or too slow for humans, depending on the mood of the dog or the number of things that catch its fancy while walking. This behavior of dogs makes walking them very difficult and challenging. Walking a dog is even much more difficult if you have a big dog that is very energetic and very curious. When your dog does not have good leash manners, what happens is that instead of you walking your dog, your dog will be the one walking you. Dogs are not born knowing how to walk with human, so if you want your dog to walk the way you want, you must train it. 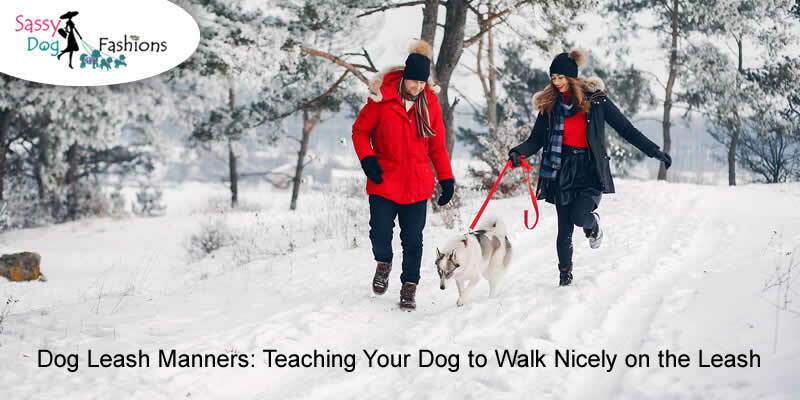 Teaching your dog leash manners can be challenging and can take some time but the result is a well-behaved dog that is a joy to walk with; therefore, everything you put into teaching your dog to walk nicely on the leash will be well worth it. The leash and collar are the equipment needed to walk a dog, so it is obvious you have to get them first. Make sure you get a suitable Dog leash and collar that fits perfectly. Most importantly, make sure the collar is not too tight; you would not want the collar choking your dog. Also, if the collar is uncomfortable, your dog will try to get it off and there is no way your dog will walk nicely on a leash when the collar is too tight. Some of the basic commands for dogs are ‘sit’, ‘stay’ and ‘come’. You should teach your dogs these commands before leash training. These commands come in handy when you take your dog for a walk. For example, ‘Sit’ and ‘Stay’ teaches your dog to stay still if you need to chat with a friend; when you have to wait in line; or when you have to wait before crossing a street. The first advantage of giving your dog its favorite treat while you both go for a walk is that it will always look forward to walking with you. Treats can also be used to train your dog how to walk nicely on a leash. When you start walking, give it a treat at every few steps, then stop giving treats and walk some distance before you give the next treat. This will make it look forward to the next treat, thereby making it stay close to you and walk at a pace you like. Apply a gentle leash pressure anytime your dog is not walking, walking too slow, or walking too fast. Never forceful pull your dog. Reward with treats once it starts to come to you and when it starts behaving or walking the way you want.